Today I have for you my next fabulous Vintage Tea With Me video featuring my Monthly Vintage Attire sharing my favourite outfits and some of the pinup fun I had in January 2019. I’m also sharing some channel updates, as my schedule has changed making me even busier I’ve decided to release two videos a week rather than three, so I’ll be posting every Thursday and Saturday (GMT+8). Be sure to subscribe for more vintage fun. 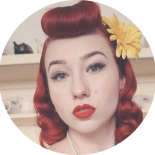 This entry was posted on February 9, 2019 by Miss Lady Lace in Monthly Vintage Attire, Videos, vintage tea with me, YouTube and tagged 1940's, 1950's, glamour, miss lady lace, perth, perth pinup, perth pinup blog, pin up, pinup, pinup blog, pinup blogger, pinup fashion, pinup girl, pinup life, pinup lifestyle, red lips, retro blog, vintage, vintage blog, vintage blogger, vintage glamour, vintage perth, vintage pinup blog.